I love the Fall. I love the smell of Fall, whether it be baking spices or dried apples and cinnamon boiling on the stove. Everything is flavored with pumpkin…well, that part I can leave because it seems that pumpkin is everywhere. Expect the pumpkin chai tea from Starbucks, and pumpkin rolls. So, never mind, bring on the pumpkin. But, another great flavor of the Fall season is apple, apple cider to be specific. And it’s the time we all eat a lot of hearty vegetables like Brussels sprouts and carrots. 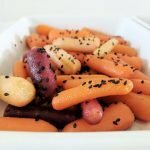 I have been experimenting around with flavors to cook carrots with, and I think I found a keeper. How about a glorious apple cider glaze? As I have aged, my eyes have just really gone downhill. I think it’s because my Mom didn’t make eat as many carrots as I should have growing up. Yes, I am blaming my Mom. But now I am eating enough carrots to make up for it, my skin is even starting to gain a little orange glow. And now that I have discovered the art of steaming, carrots are one of my top go to vegetables. 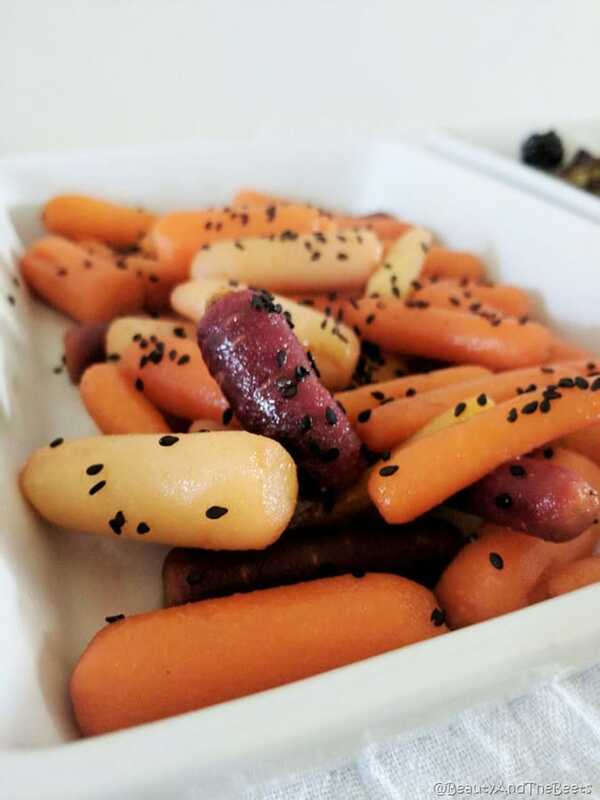 For these Apple Cider Glazed Carrots, I used baby carrots simply because they are already peeled and ready to go. A one pound bag was sufficient as a side dish for a family of 4 – Mr. Beet and I eat bigger vegetable portions so for us it was enough for us to split. I think the key here is also to use pure maple syrup, not that table syrup gimmicky knock off stuff. Buy the real stuff, you should be have 100% pure maple syrup in your house anyway instead of that chemically processed crap. The fake stuff won’t thicken up as much as the real thing. And I used raw apple cider vinegar, again, less processed. And if you like a little extra sweetness, you can add a tablespoon of dark molasses. I added the molasses to the recipe, but it is completely optional. 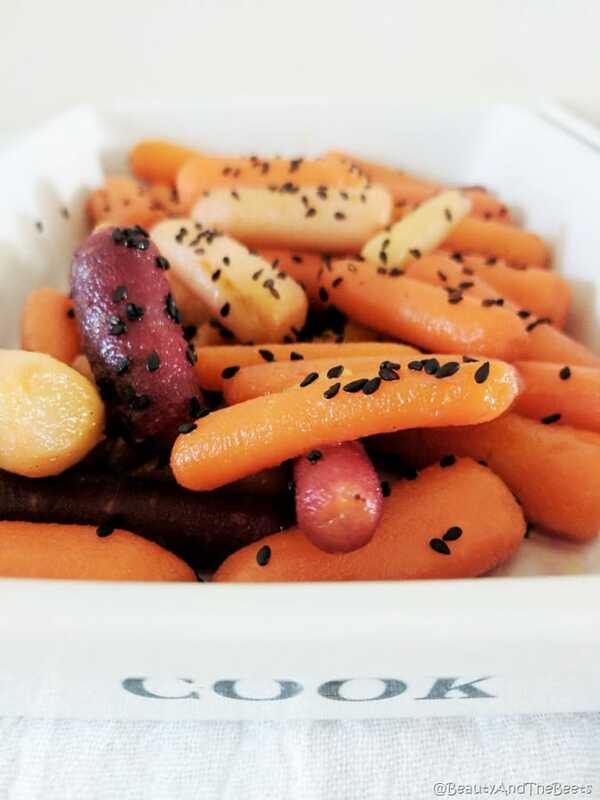 Enjoy these Apple Cider Glazed Carrots and Happy Fall! Heat the sesame oil in a large saucepan over medium-high heat. Add the carrots, reduce heat to medium. Cover and cook carrots for 7 minutes. While the carrots cook, whisk together the apple cider vinegar, maple syrup, and molasses, if using. Add the vinegar mixture to the carrots and boil, uncovered. Let the carrots sit for 1 minute, until the sauce begins to thicken slightly. Partially cover the carrots and let sit for about 5 minutes. Great recipe!!!!!! I love the Fall too – my most favorite time of the year.